1. 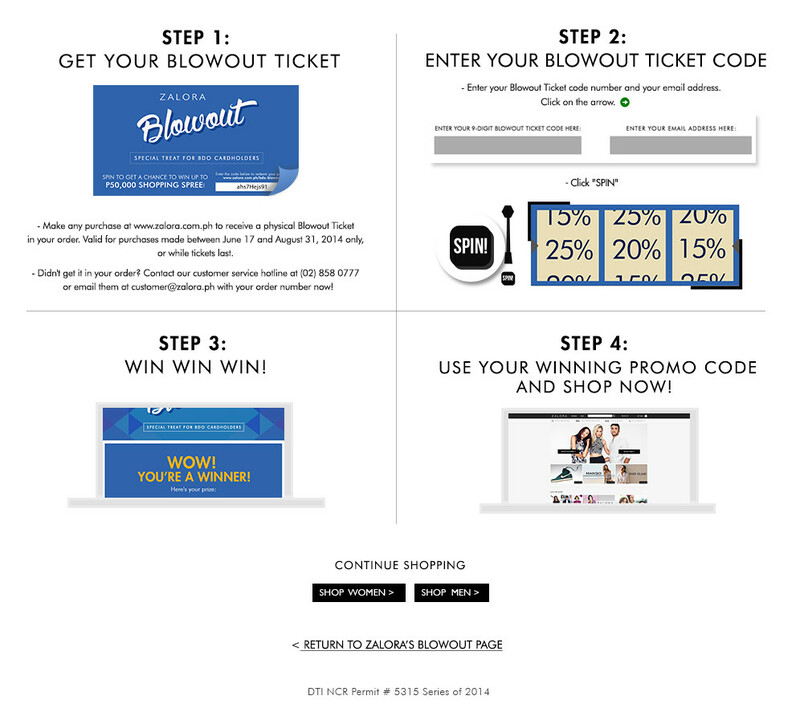 Make any purchase at marketplace.zalora.com.ph to receive a digital Blowout Ticket in your e-mail. 2. Valid for orders received from June 9 - September 15, 2014. 4. Key in the unique 9-digit code and input their valid e-mail address to get a spin. 5. The slot machine will show the BDO cardholder their prize in the form of a promo code. a. Valid for items in main catalogue only. b. Not valid for sale items. c. Brand and category exclusions apply. 10. This promo can be used in conjunction with MasterCard Thursdays promo only. BDO Credit Cardholders will receive the ZALORA Blowout ticket containing a unique 9-digit code issued with their Monthly Billing Statement. ZALORA customers will receive Blowout ticket for every purchase made from June 17-August 31, 2014 or until supplies last. BDO Cardholder needs to key in the unique 9-digit code and input their valid e-mail address to get a spin. The slot machine will show the BDO cardholder their prize in the form of a promo code. This promo is open to BDO Credit Cardholders who will receive the ZALORA Blowout insert containing a unique 9-digit code issued with their Monthly Billing Statement and ZALORA customers who will receive the inserts with their purchase during the promo period. Prizes involving gift promo are (a) valid for one-time use only for each registered customer at www.zalora.com.ph (b) not valid in conjunction with other promotions or discount codes. BF Jade E-Services Philippines, Inc. reserves the right to change the terms and conditions, or cancel any promotion, at any time without notice.